The conflict between Marketing and Engineering almost always stems from the fact that Marketing wants a product that can do everything, while Engineering wants a product manufactured within the confines of practicality. Marketers see engineers as the adversaries that are insensitive to the requirements of the customers, while engineers see Marketing people as the antagonists that always over-promise to customers, practically setting the stage for disappointed clients. This conflict can be seen in many companies belonging to different industries, like software development, manufacturing, construction, energy, FMCG, movie production – name it, and you will find these two departments constantly bickering. Senior Managers oftentimes attempt to solve such differences by talking the two departments into working together or finding the so-called middle ground. Unfortunately, this solution does not always work, particularly if the conflict arises from deeper differences, like in expertise, experience, culture and leadership. In other cases, Senior Executives will prefer to form committees, composed of members of the two departments and other external shareholders, to collectively decide on salient issues concerning products and their development. This method has had its successes in the past, but its results are still inconsistent and inconclusive. 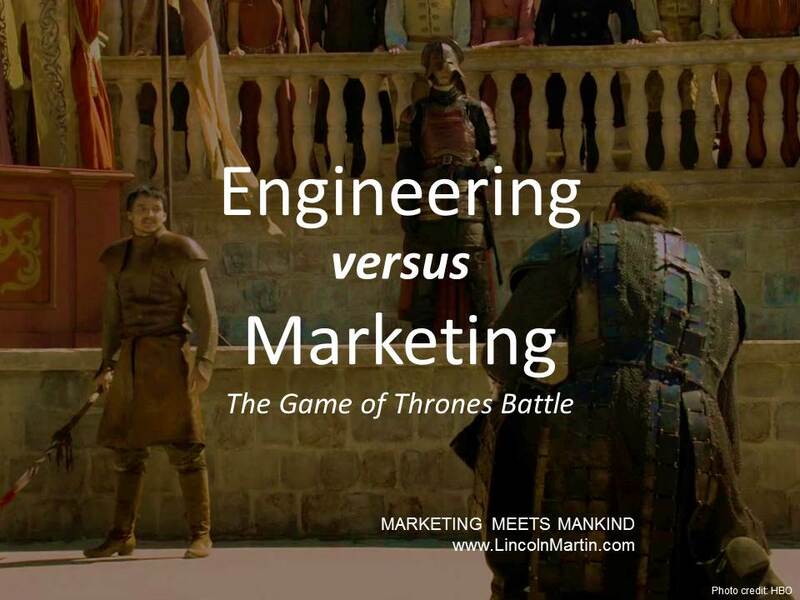 Let’s face it, the difference between Marketing and Engineering is comparable to the dissimilarity between the Starks and the Martells (HBO’s Game of Thrones). When the Starks are the masters of getting what they want through talking, the Martells highly depend on their technical knowledge to solve their issues. When the Starks survive by their contacts, the Martells thrive with their ingenious and inventive tactics. So, is this a dead-end? How will a company resolve the constant horn-locking between the Marketing and the Engineering departments? Experts have come up with sound suggestions to turn the hostility between the two departments into a source of valuable input that will further drive the growth of a company. The two departments must remember that products have certain fundamental features that they cannot exist without. These features should be prioritized. On the other hand, there are attributes that are “nice to have” and are being “desired” by customers. These features could be introduced into different versions of the products in the future. It is also healthy for the two departments to keep a sort of a “wish list” that they can go back to when planning for future versions. The two departments should make the project management process transparent, so they build between themselves – as well as among other stakeholders – mutual trust. According to research, when the two departments trust each other, they will increasingly think of the reciprocal benefit of their product choices. For instance, Marketing will be motivated to explore different product options that will work better for Engineering, while Engineering will be inspired to ensure that each request for features encounters as little technical difficulty as practically possible. The two departments must be prepared to strike out features that will stall product development. They must remember that despite a project’s lack of feature, when it is on the market, it can be making money. After all, they have their “wish list” which could always spark new ideas when planning for new versions or new products. Experts sound a caveat that these suggestions may not be easy to implement, and could be met with resistance and objection from the two departments. However, once successfully employed, their merits and fruits will be appreciated not only by Marketing and Engineering, but by every stakeholder of the company.